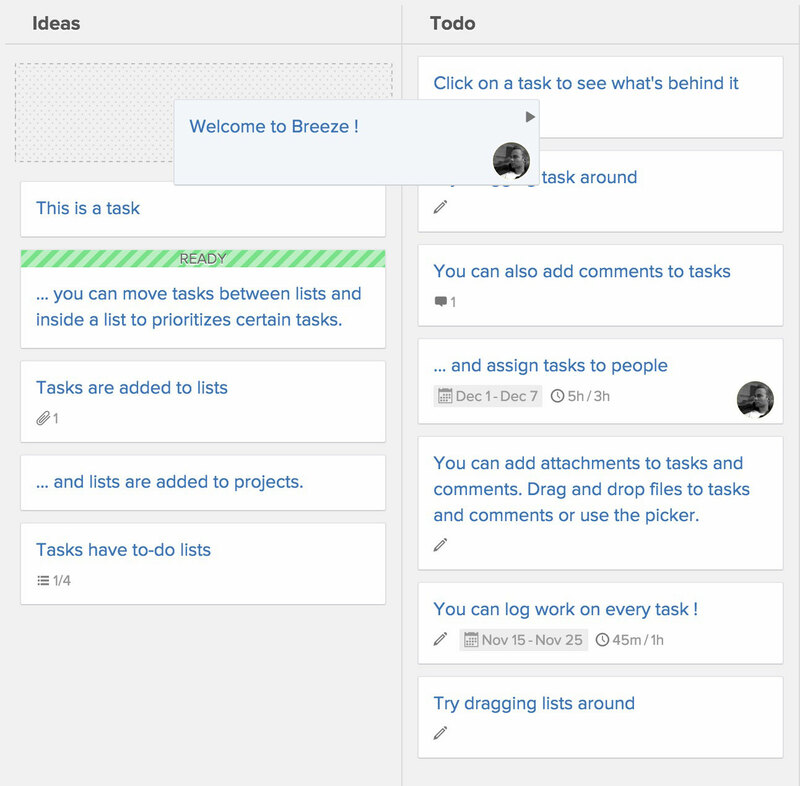 A visual way to organize and interact with your projects. Breeze is simple on the surface, but has everything you need to get work done - tasks, to-dos, time tracking, estimates, budgets, files, calendars, reports and more. This is your project board. It has lists filled with tasks, used by your team and clients, from accountants and marketeers to developers. It gives you a high-level view of your project at a glance. 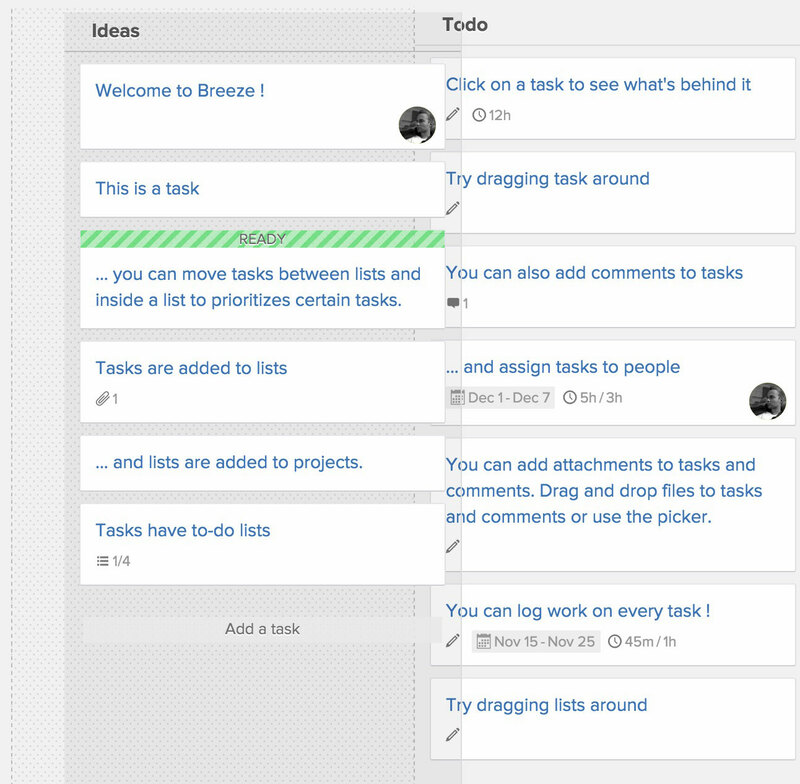 Drag and drop your tasks between list to prioritize them. Start from the left and finish on the right. Add and reorder the lists as you need. Customize the board to suit your needs and workflows. You can hide list from clients to have private tasks, a good way to share some parts of your projects. Invite your clients and let them observe, sometimes you just need to show your clients what's happening and not have them add new tasks to the board. Work together with your team and clients. Discuss and leave feedback on tasks. 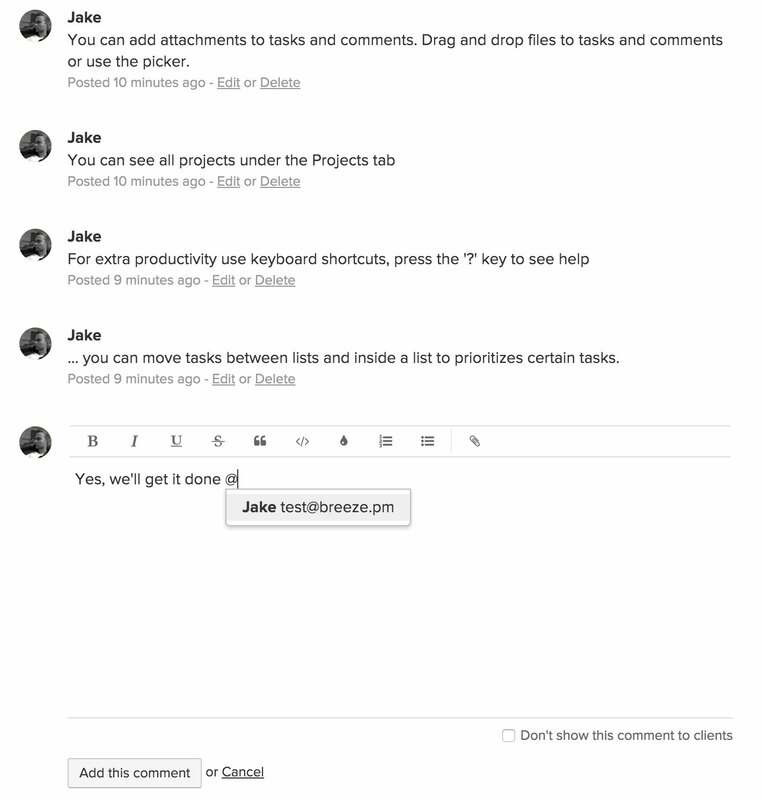 You can collaborate behind the scenes - add private comments that only you and your team can see. Upload files directly from your computer or link them from Google Docs, Dropbox or Box. When someone adds a comment you'll get an email, just reply to it and your comment will be added to the task. All of your communication and feedback neatly contained in the appropriate task and organized. 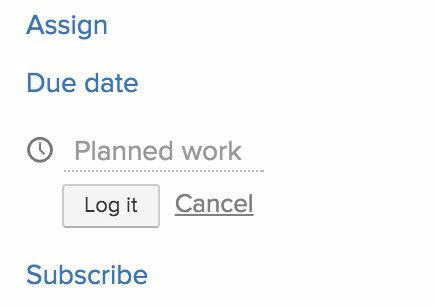 Plan what needs to be done by writing it down using the simple editor, organize your work under tasks with to-dos. Divide your to-dos into lists. 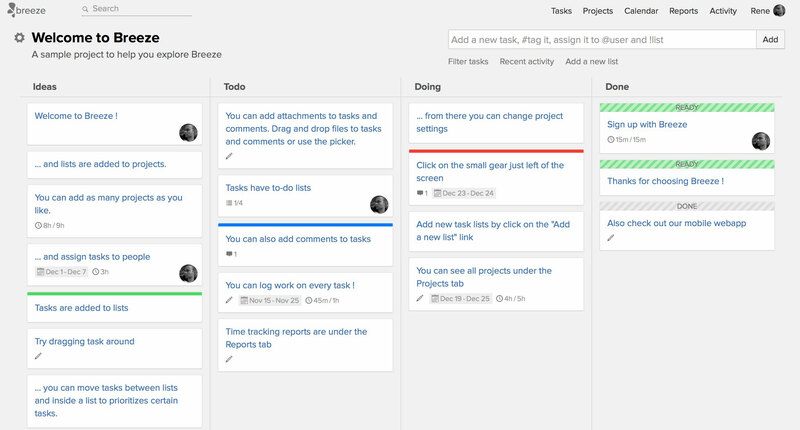 This helps you prioritize and get a better overview of your tasks. Assign tasks and todos to other team members, set due dates. Everyone knows what they’re responsible for, nothing slips through the cracks. Breeze has a built-in timer that your can use to track your work. Just click on the play button to start tracking. Set the time billable or not billable, project-wide or for every entry. You can close your browser and come back later, your time is saved on the server and you never lose a minute of your work. If you prefer, then you can enter your hours manually or even keep using your current time tracking app. We have integrations with Toggl and Harvest. Project budgets with task estimates. Set your billing rate for each project and keep track of hours spent and total expenditures on all your projects. 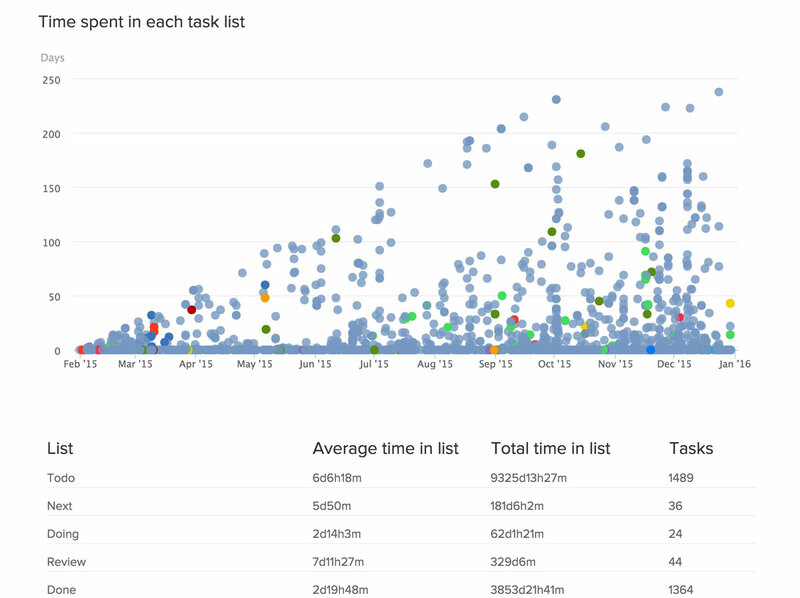 You can estimate each task individually and log your hours against it. Enter your total project budget in hours and your hourly rate. The total budget will be automatically calculated, you can also change the total amount if you wish. Time tracking and estimates work hand in hand. Reports for big picture and drilling down. When you're responsible for the projects you need to know what's happening in them. Who's doing what, where things are in a workflow, what's overdue, how much time has been spent. 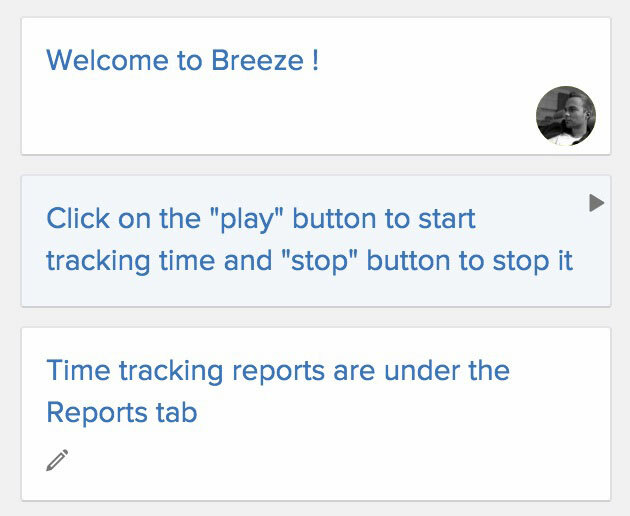 Breeze has all the reports you need - tasks, tasks due, time tracking, project totals and task completion, group them by users and projects. Bookmark your reports for quick access later. You can share your progress with everybody using public reports. Anybody who has the secure link can track your progress, they don't need an account in Breeze. This is a good way to keep your clients up to date on the projects. You don't need to send reports every month, they can see it instantly. Use the analytics report to keep and eye on your lead and cycle time. You can instantly see the tasks that are taking too long to complete. Get the big picture and improve your lead time by analyzing the progress over time. A quick glance at the spread of the dots speaks a thousand words. Add extras when you want them. Instead of cluttering Breeze with features you'll never use, we offer optional free add-ons. Whether you need accounting, real time chat, code management, Gantt chart or something else, we got you covered. 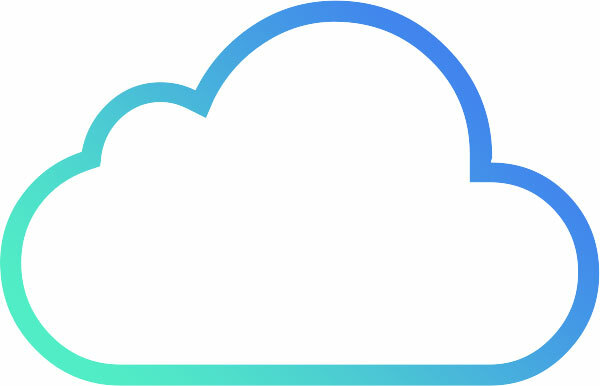 Breeze has integrations with Slack, Github, Toggl, Freshbooks, Groove, Harvest and more. You can find the entire list from our extras and integrations page. It’s a way to offer more and keep things simple without cluttering it for everybody else. Nothing to install or upgrade. There’s nothing to install, download or upgrade. Breeze is ready as soon as you create an account and everyone gets it instantly. No matter where you are located, your projects are always with you, close at hand, monitoring the heartbeat. Breeze keeps an eye on everything and lets you know instantly when something needs your attention. It's perfect for teams spread all around the world, office not required. Breeze is used by freelancers, small to medium sized companies and large multinationals from every walk of life. 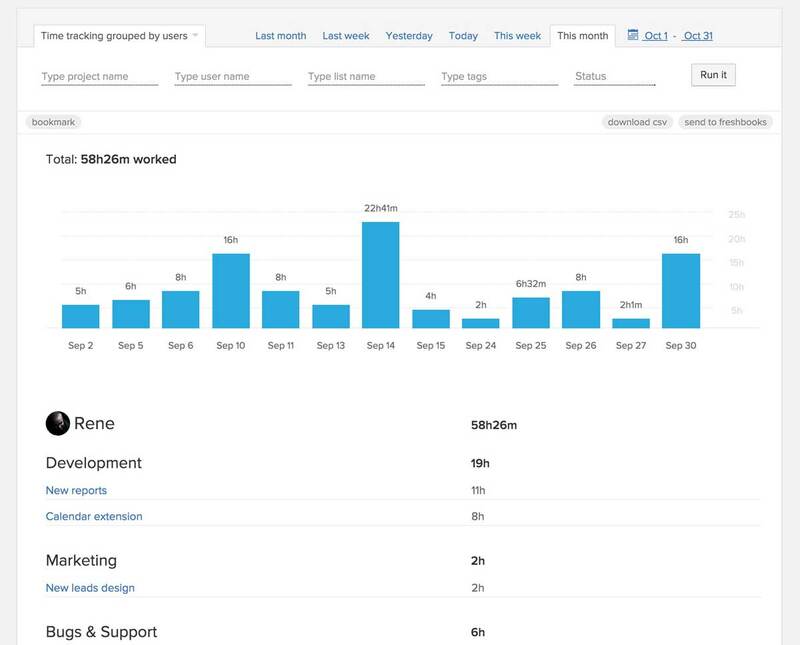 Developers, marketers, project managers, accountants and designers track their projects with Breeze.